Heat the oil in a wok. When it get hot, add the mustard seeds and allow them to pop. Then add the cumin seeds. Add in the onions and let them soften and become translucent. Add the tomatoes and give them a stir. Next, add the turmeric and mix so that everything gets evenly coated. 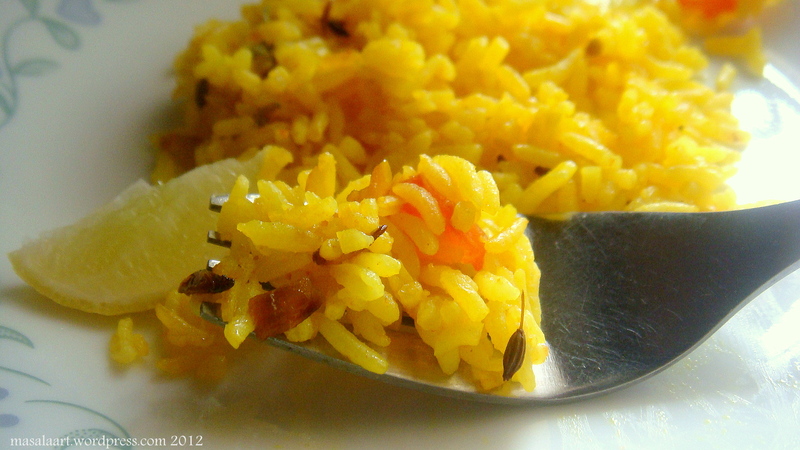 Add in the cooked rice, and stir well so that the yellow colour from the turmeric coats the grains of rice evenly. Squeeze lime juice and mix well. Pull off heat and garnish with coriander. Hope you are all having a lovely week. I really need to respond to my huge queue of comments. I do not know how some of my friends do it- Anita, Ameena, Caroline, Madhu, Heather…all of you are so prompt and dedicated with your replies! I know what the reason is though. I am always looking at other people’s pretty blog pics. Still not a good enough excuse. This is good inspiration here as I am always throwing away rice that I don’t use. I need to get better with leftovers. Great recipe. Thanks so much!! Yeah rice when left in the fridge can get pretty tough and grainy, and more often than not you end up disposing! This looks so yummy and easy! Love rice. Right now I’m full of soup and ice cream after having my tooth out. I’m not allowed to go in the kitchen (or anywhere that isn’t the sofa) which is driving me mental, but hopefully tomorrow I can convince the other half that this is a quick and soft-ish thing for me to cook as I get back to normal food! Oh I hope the tooth heals soon! And hey- soup and ice cream ain’t so bad. But yeah, after a while you crave something with more bite to it!! I read that post that Caroline wrote; it was super! I re-purposed leftover brown rice yesterday. Shrimp fried rice. Yessssss! 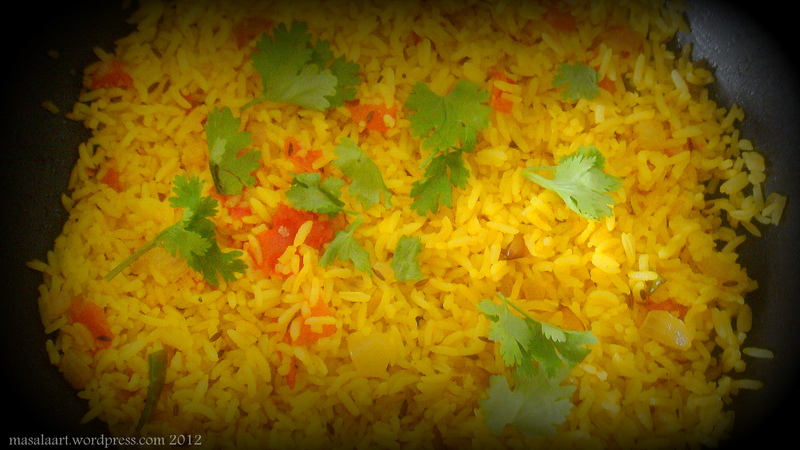 I love rice any way, but I have to dress it up for my family to eat it. Your recipe looks dang good, girl!! Shrimp fried rice!!! It is the best form of fried rice, beats chicken and shredded beef hands down. Have you seen that episode of How I Met Your Mother where Barney gets the whole bar to chant ‘shrimp fried rice’ it as a social experiment? Rice is my most favorite thing. I eat it 2 X a day at least! Crazy but true. I love that you can morph it so easily into something new. You are talented. And as far as my replying to comments, I sit down once a day and do them all at once! It’s super efficient. Have a great weekend Meenakshi! Yeah I remember your post about eating rice cakes with butter!! Lol. And I am going to follow your advice about the comment replies. As you can see, my current format of lying low and spamming my own blog with comments is not very healthy. Love rice and almost any variation of it. This looks like a keeper! Thank you soooo much Caroline! Coming from you, it is very flattering indeed.. I should try adding some kalonji, I have some in my cupboard.